Although we are primarily a bread-making bakery, we do occasionally make sweet treats for events and the holidays. One of our favorites is scones. Whenever a scone-making occasion comes up, we tend to make a few (or a lot!) 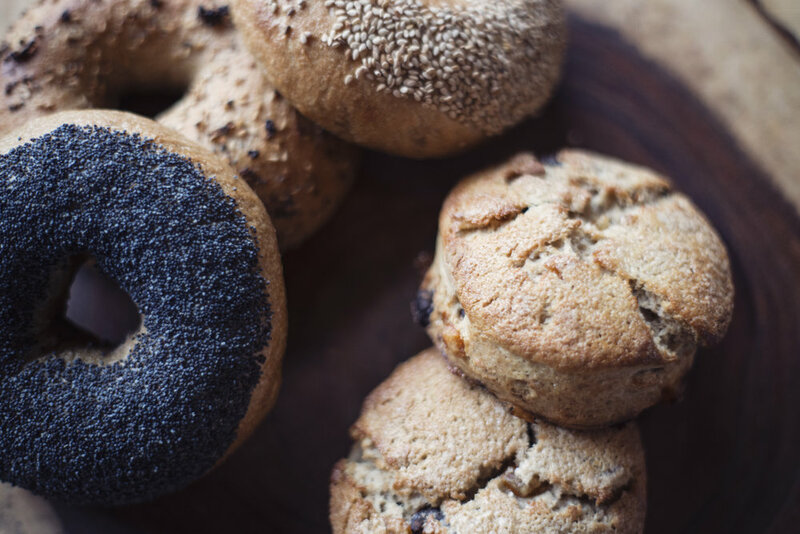 extra for bakers’ morning snacks…..
What makes our scones special is that they are made with 50% bread flour and 50% whole grain flour. The whole grain flour adds a pop of flavor that will make you never want another all “white” flour scone again. Just the basic recipe has so much flavor that you almost don’t need to mix in any chocolate or nuts. Almost…. Combine dries and mix. Cut cubed, cold butter into the dries, creating small pea sized clumps. Add heavy cream and half & half, mixing until just combined. Do not over mix! You want clumps of butter in the dough. Flatten dough to 1.5 inches thick and divide using a scone cutter or a knife. Brush tops with heavy cream and sprinkle with sugar before baking.